January 2016 – Welcome to Daly Dose Sports- Your dose of sports and sarcasm. This week on the Daly Dose Sports Podcast Clint is joined by sports columnist Dillon Brooks and they break down the NFL Championship games and begin taking a look at Super Bowl 50. Plus a look at a few NBA stories and then Clint counts down the Top 5 Oldest quarterbacks to ever play in a Super Bowl! Check out episode 61! The Denver Broncos beat the New England Patriots on Sunday 20-18 in a thriller that sends Denver to their eighth Super Bowl in franchise history. Quarterback Peyton Manning threw for two touchdowns, and the Denver defense forced two interceptions from Patriots quarterback Tom Brady, and the Broncos earned their second Super Bowl trip in three years. 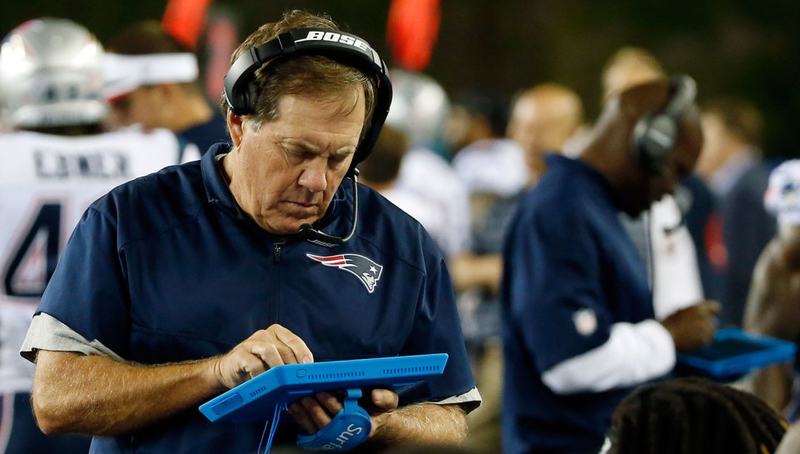 But the big story following the game was the fact that the New England Patriots Surface tablets stopped working and that it may have been due to corporate espionage. According to numerous reports the tablets on the Bronco side of the field were working fine but NFL rules do not mandate that Denver turn them off as would be the case if the electronic headsets were malfunctioning. The team tablets are connected to a dedicated private wireless network and are used to look at real-time photos of previous plays and to study the tendencies and formations of the opposing team. The problems were connectivity-related and were resolved after about 20 minutes. However, the Daly Dose has learned that the Patriots’ electronics issues may have been self-inflicted. Unfortunately he took out the wrong sideline. When asked about the situation following the game Belichick was adamant that he had never authorized such a thing. On Episode 60 of the Daly Dose Sports Podcast Clint talks about a new rule in Wisconsin high school sports, and hands out some end of year college football awards. He talks some NBA stories and then he breaks down the NFL Divisional playoff games and previews the Championship games coming up this weekend. Finally the Daly Dose Top 5 counts down the Top 5 individual rivalries in sports history! LeBron James was seen texting on his cell phone from the bench during the Cleveland Cavaliers loss to the Golden State Warriors on Monday night. The Warriors beat the Cavs 132-98 as Golden State guard Stephen Curry scored 35 points and added five rebounds and four assists. Forward Draymond Green dropped in 16 and collected 10 assists and Andre Iguodala chipped in 20 coming off the bench to hand Cleveland their worst loss of the season. The win pushed the Warriors record to 38-4 and dropped the Cavaliers to 28-11. LeBron James scored 16 points for Cleveland in the losing effort and was clearly frustrated throughout the evening. He was given a technical foul and guard JR Smith was ejected late for smashing into Warriors forward Harrison Barnes. Late in the game James could be seen on his cell phone texting. The Daly Dose was able to get a copy of these texts which appear to be to Miami Heat guard Dwyane Wade. On Episode 59 of the Daly Dose Sports Podcast, Clint is joined by Larry in Centennial, and they discuss what they would do if they win the Powerball Jackpot. Plus recapping the College Football National Championship game and NFL Wild Card Weekend. Then they look forward to the NFL Divisional playoffs coming up. Finally, Clint counts down the Top 5 things more likely to happen than you winning the Jackpot tonight. Check out Episode 59! The Alabama Crimson Tide found a way to outlast the No. 1 Clemson Tigers last night in the College Football National Championship game 45-40 in Glendale Arizona. And while dedicated Tide fans are basking in the glory of their fourth title in seven years they also found themselves enjoying the play of Clemson wide receiver Hunter Renfrow. Renfrow was electric on Monday night catching seven passes for 88 yards and two touchdowns. What about Bama tight end OJ Howard who caught five passes of his own for 208 yards and two touchdowns? This seems to be yet another southern mystery that may never be solved. On Episode 58 of the Daly Dose Podcast Clint talks about the winners and losers from the college bowl season and gives a National Championship preview Daly Dose style. Then Mike from Castle Rock stops by to preview the NFL Wild Card weekend. Finally Clint counts down the Top 5 bitter quarterback controversies of all time! Check out Episode 58! The 12-4 Denver Broncos clinched the No. 1 seed in the AFC playoffs on Sunday by beating the 4-12 San Diego Chargers behind the injured/benched Peyton Manning who came on in relief of Brock Osweiler to get the win. Nothing else has made sense this season. So why should we expect it to start now? The Broncos started this season with seven straight wins. But four of those wins came via crazy last second plays. Denver then lost two games in a row and Manning looked to possibly be finished. He was benched in Week 10 against the Chiefs with a foot injury but we all knew what had really happened. Father Time had finally caught up with him. The Broncos then proceeded to win three straight games under backup quarterback Brock Osweiler including a win over the undefeated defending Super Bowl champion New England Patriots. Which doesn’t really make much sense. But Denver then dropped back to back games against the Oakland Raiders and Pittsburgh Steelers. And Denver led both of those games in convincing fashion in the first half. That certainly didn’t make any sense. But the Broncos somehow found a way to beat the Cincinnati Bengals in overtime last week coming back from a 14 point deficit to clinch a playoff berth. And then on Sunday, the top seeded Patriots lost their second game in a row and the Broncos scored on their second play from scrimmage, a 72 yard pass from Osweiler to Demaryius Thomas. And it looked like the Broncos would cruise to the top seed. But then they turned it over five times and the 4-11 Chargers took a 13-7 lead in the third quarter. With so much to gain for the Broncos from a win, and nothing to gain for the Chargers, none of this was making any sense. So head coach Gary Kubiak decided to go with his gut. Brock Osweiler hadn’t played poorly. But the Broncos needed a boost. He reinserted Manning into the lineup. The hometown crowd went wild and the Broncos reeled off 20 second half points to get the win and clinch the top seed in the AFC. Manning went a very workmanlike 5 for 9 for 69 yards. No touchdowns. No interceptions. But no turnovers while he was in the game. And no one dared to put the ball on the ground with the Sheriff on the field. Denver now heads into the postseason with homefield advantage throughout the playoffs. The Broncos have beaten the No. 2 and No 3 seeds in the AFC (New England and Cincinnati) but have lost to the two Wild Card teams (Kansas City and Pittsburgh). Oh and we have no idea who the starting quarterback is going to be. Which when you think about it… the way this season has gone…kind of makes perfect sense.